Although we missed this storm, after it passed by us, it spawned some tornados to the southeast of us. 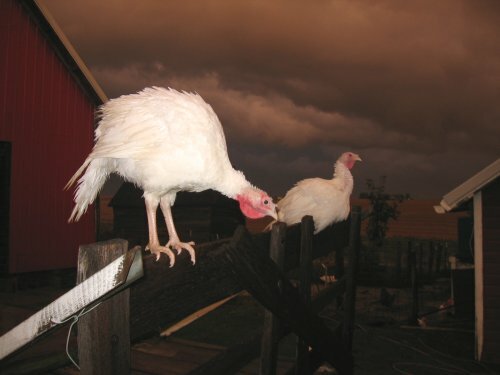 Like good turkeys, when the rain came, they sought shelter under the wagon, so they have at least a smidgeon of common sense left. Today we had some students from a livestock class tour the farm. 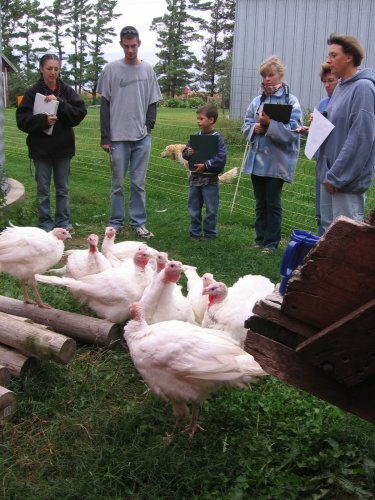 It sounds like a fun class – the students tour dairy, elk, goat, and a wide range of common and uncommon livestock farms. We fit into the small and diversified category. Here, I am getting ready to demonstrate how owl hoots get the turkeys to gobble and fluff up their feathers. I still remember when I learned this trick from a turkey hunter when I had a summer job at the Story County Conservation Board. I didn’t believe “Joe” when he said, he could make wild turkeys gobble. 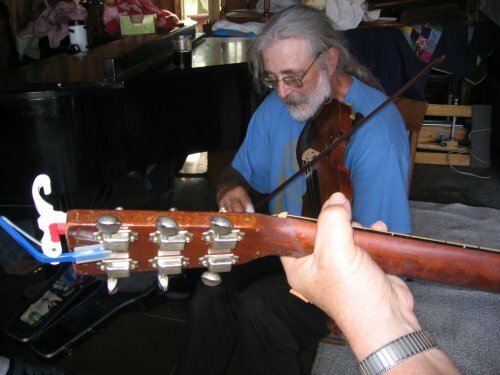 So one day when we drove down a gravel road into a small timbered valley, he stopped the truck, stuck his head out the window and gave some owl hoots, and out of the woods, came the turkey alarms. I didn’t think there were any wild turkeys living there, let alone that he could get them to talk. It even works on domestic turkeys. I guess the owls are one of the turkey’s enemies and if they hear an owl, they set out the alarm. Claire has taken to heart the wide-wide world of duct tape with this application that I have not yet run across – the duct tape homecoming dress, with lacey frills. Even the shoes are duct tape and lace. It kind of reminds of the old song by Don Henley and Stevie Nicks with the lyrics, “give to me your leather, I’ll give you my lace.” Well, duct tape and lace are lot less expensive. 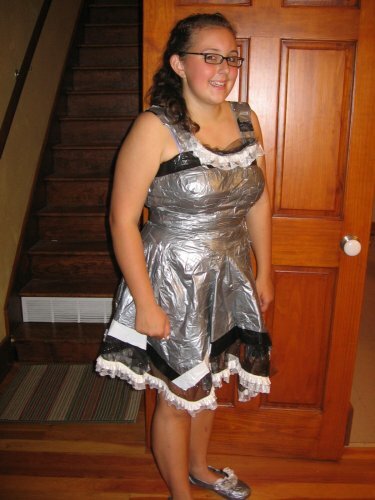 I’m not sure if Claire’s home-made duct tape dress was a statement against the excesses of high school dance outfits, or if her allowance forced her to economize on her apparel. She reports it was difficult to get off and on, but it held up quite nicely throughout the dance. 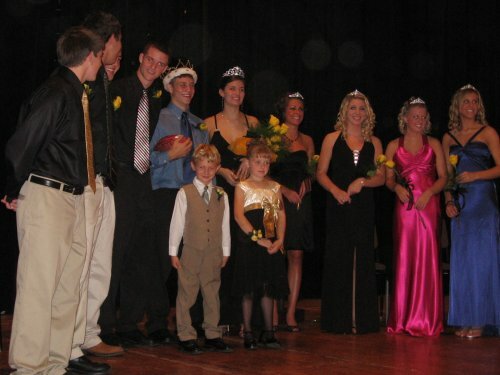 September 26, 2007 – Family Homecoming Royalty! We found out earlier this week that Martin was the junior boy in the Homecoming Court! Here’s Martin with the Homecoming Court at the Coronation at the high school auditorium. 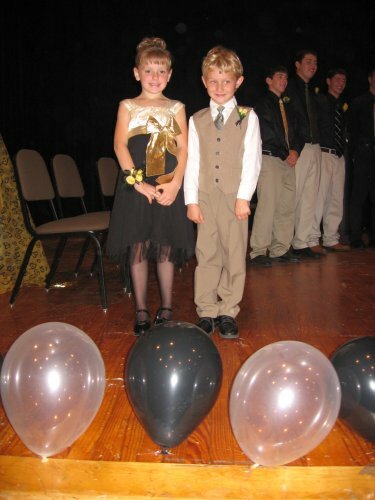 Last year he talked often about Ashlen one of his three “girlfriends.” She was the junior girl in the homecoming court. Here they pose after the ceremony. I don’t think either Linda or I ever even attended a homecoming coronation in high school, so it is sometimes strange what your kids get you to do! He got to ride in a red mustang convertible during the parade and did the royalty thing at the football game as well. When people wander to the basement and see our assortment of canned goods, they accuse us of being Mormon or survivalists! Since we’re near the end of the canning season, I thought it would be a good time to show the canned goods. This reminds me a bit of the inside cover of Bill Bryson’s “Thunderbolt Kid” that shows a family of the 50’s posing in front of all the food they’d consume in a year. (Though, I didn’t drag out all the frozen stuff from the freezer or root crops for this photo.) I wondered how drastically that picture would change if you did the same today for the average American family – it would be dominated by pre-packaged foods and fast food containers. 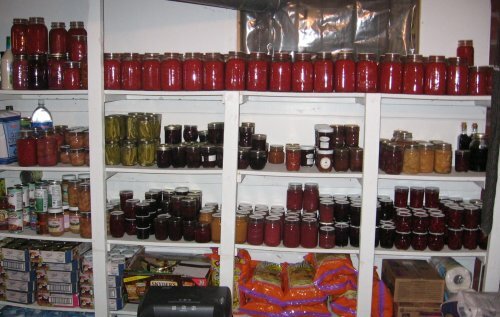 The shelves contain stewed tomatoes, pickled dilly beans, peaches, blueberries, blackberries, salsa, raspberries, applesauce, and about six diffferent types of jam. The hops experiment has been somewhat successful. 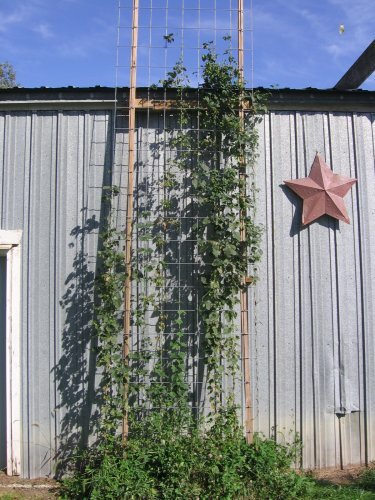 The vines didn’t cover quite as much of the trellis as I’d hoped, but it did produce hops in year one! Check out what it looked like on May 11 from the same vantage point. 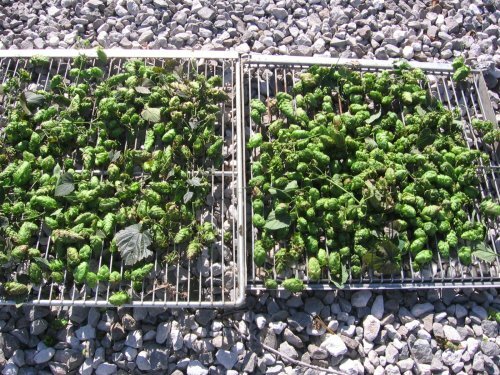 Here’s some of the harvest on the drying racks. I’m virtually clueless on the correct time to harvest hops in this part of the country. Any brewmasters out there have advice for me on timing and post-harvest? 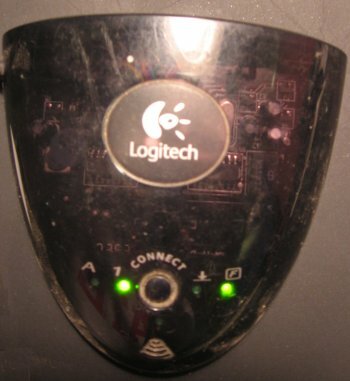 September 23, 2007 – A Small World! 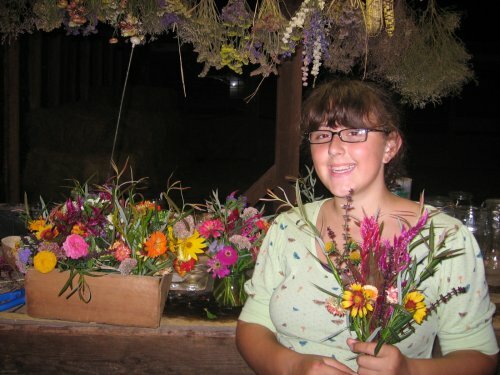 She’s the one behind the piano and the one with seven pianos in her garage! I’m bad at remembering names, but another jammer. Here’s the “small world” section of the entry. 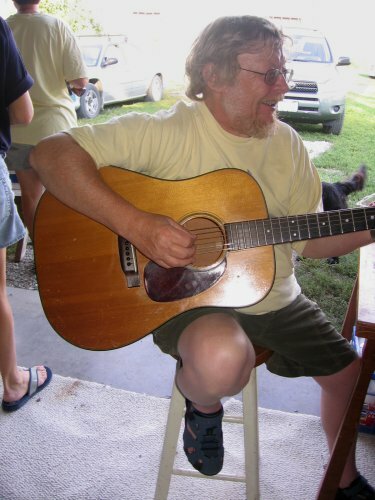 This is Tim Jenkins, renowned in this part of the country as a fine dance caller. I noticed his shirt was from a place close to one of my relatives who lives even more “off the grid” than we do in SW Wisconsin. I asked if he knew him and his eyes lit up and turns out they play together a frequently back in Wisconsin. 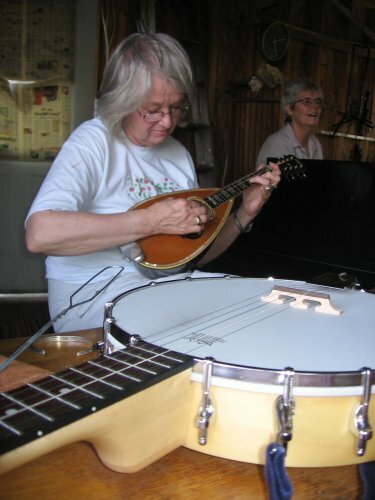 Today was the annual Octemberfest Celebration in Marshalltown. I forgot to bring my camera to the parade, but wished I had my video camera. Here’s what happened. The sheriff’s department was marching, including the honorable Sheriff Ted Kamatchus. Like all good county sherriffs he was throwing candy to the kids. But Sheriff Ted really upped the candy ante for this year’s parade. No little tootsie rolls, no small caramel chews, but fun size snickers. He had already gone past us, but turned around and Martin has learned he’s cute and if he waves his arms, candy flies his way. Well, the sherriff spied Martin and needed a strong throw to get the Snickers to back Martin. The sherrif has quite an arm – the candy whizzed at Martin at MLB pitcher speed instead of church league underhand softball speed. 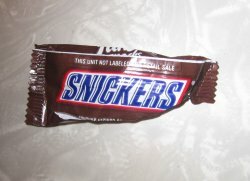 The snickers hit him on the cheek and he bent over as if to cry – I thought he was first just bending over to pick up the candy, but he didn’t come back up. When we got a look at him, his eyes were watering, on the verge of tears, and there was a red welt on his cheek. It would have been a great YouTube video of the sheriff trying to be nice, but with unintended consequences. We made sure Martin ate his prize Snickers first! 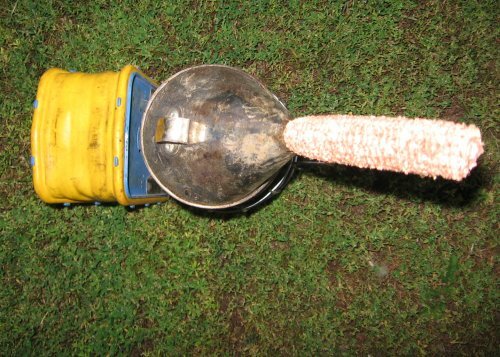 The state’s main commodity crops are in drydown. 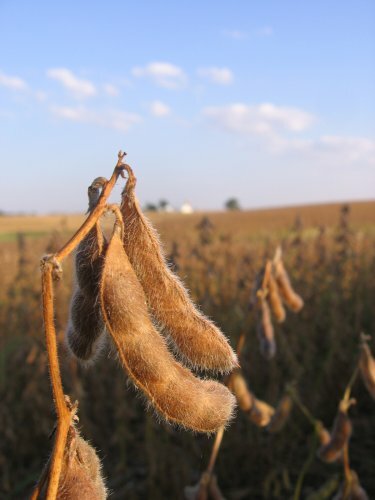 Here’s a group of dried soybean pods, about ready for harvest. The first combines are out this week. I started scrambling a bit today when I saw our neighbor starting on corn. Since he’s the one that loads up our wagons for the corn stove, I spent a good part of the day getting the current contents of the wagons unloaded. One had ground broiler feed, so I scrambled to find enough empty garbage cans to accomodate all the feed. The other had some corn left over from last year, so I bagged all that up as well. Now I’m ready when he comes over to fill up our wagons. Linda hired the girls to help since it was such a big job for a work day. The frost did not take out the berries. 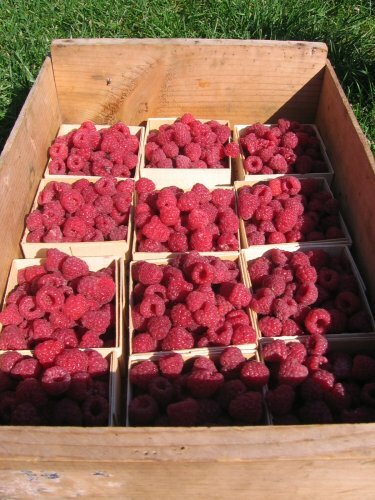 Here’s one crate – we got over three of these and only pickedÂ a little more than half the berries. I’ll miss these in the winter (but we’ll have ’em frozen and canned to enjoy). The turkeys have taken to roosting on the top of the back brace of the hay wagon. They crack me up. 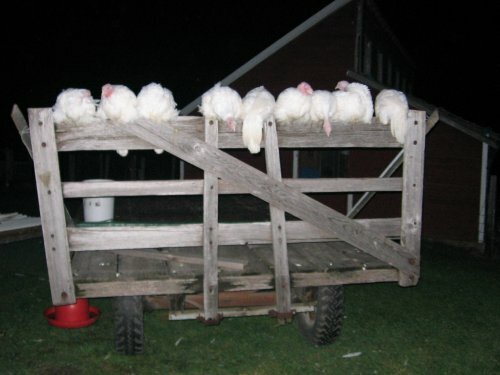 It’s actually a good place to roost, especially if your behind is over the back instead of over the wagon! I wonder how long they’ll be able to fly up to roost as they get bigger? Nine are roosting up on top and one stays on the ground. I wonder if the ground-dweller is the mystic/philosopher of the flock or just the least intelligent one?